double-d Mountain Runner: The Rivah! Last year in the weeks leading up to the Merrimack River trail race we had to clear some sections of the course that always seem to need cleaning up. Usually the power-line section of trail is overgrown but last year it was really bad. Little did we know that the stewards were trying to end use of this unofficial trail. This year that section would be unusable. So this year would feature some significant changes. The course has morphed over the years as some trails were slightly re-routed and bridges were added. Some of the changes were a bit more significant than others but the route in general stayed the same. This year the changes would be noticeable. The decision was made to create a loop instead of a strict out-back, along with that we’d add a new trail up the power-line and a just (barely) finished trail to the turn. We’d then return via part of the “old” course with a cut-off near the Equestrian hill which would take us across Piekos Pass. This meant the course would be a bit shorter and have less climb. The fix for that was adding a hill and ¼ mile of trail by running the upper parts of Deer Jump Reservation near Launching road. I tested out the course the week before the race and it came out to 9.55 miles with 600’ of climb/descent. That would make it the same distance as the old course but would add in 200’ of climb/descent. Hopefully people would run around the same time as previous years and more importantly they would have an enjoyable experience. On Friday I met up with Petey & TiVO and we marked the course and placed out most of the mile markers (in a break from tradition we placed the mile markers at the correct distance rather than the ‘traditional locations’). On race morning I headed out early and set up the 2 mile (and 2 mile to go) water-stop at Launching road. The sun was just coming up on a beautiful day. There was little to no wind and temps would be in the low 50’s during the race. The course was dry and in great shape. I helped set up the timing and scoring area and got the volunteers in position before heading out for a 2 mile warm-up that included placing the 9 mile and 1 mile marks. Doug Deangelis joined me as did Christin Doneski. We bumped into Bob Jackman, Leslie O’Dell, and Kassandra Marin. I gave a few notes on the new course and told them that getting to the bridge (50 meters into the race) before it bottlenecked would be important. I’ve always made it through in the top 10 so I haven’t had to walk but it gets bad quickly as there isn’t anywhere to go except single-file over the bridge. 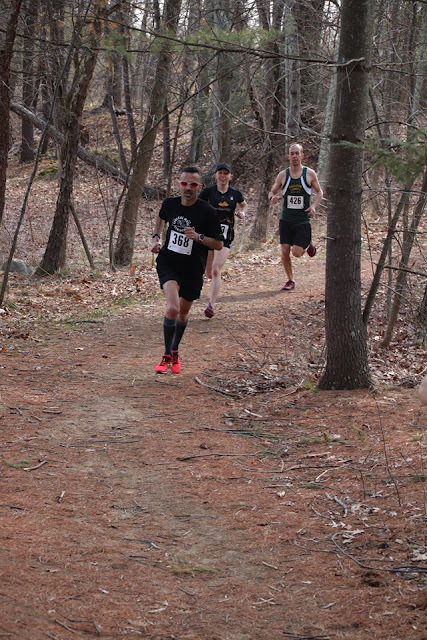 I switched into racing flats, deciding that road flats would be fine since the course was dry and had few leaves, and then did another ½ mile to stay loose. I got back to the start as Petey was going through pre-race instructions. At exactly 9am with a “Ready, Set, CAYUGA!” we were off! I zipped out and found myself in the lead. Last time I was in that position was probably 1999 or 2000. Brandon Newbould (WRT) laughed as I made a beeline for the bridge. After crossing I hugged the right side of the trail and he went by. We took the sharp left onto the River trail proper and one-by-one the top runners chugged on by me. That was fine by me, I didn’t go out fast and settled in to what I hoped would be a pace I could maintain. As we went under the highway Brandon shot over to the River-side. I hadn’t seen anyone try that move in a bunch of years. It is a little tricky and can only be done if the water is low. As it was he lost 2 spots and a couple of seconds with the unusual move (He’d move back into the lead soon after and run away with the win). A few more guys passed me and by the half-mile I was in 12th place. Dang! I had hoped to crack the top 10. I could hear footsteps behind me and true to her word Kassandra was sticking with me. I reached the mile in 6:26 which was a bit faster than last year. I felt pretty good although I was losing ground on the guys in front of me. I kept thinking “it is a LONG way to go”. Jim Pawlicki rocking the “Polska” singlet was soon out of sight and on his way to a solid race. The 2nd mile was a bit tougher with the new Launching road hill and I ran 6:49. Not much changed, except the pace quickened during the third mile (50’ of downhill helped). I hit 3 miles in 19:43 (6:28 split and 6:34 pace through 3) that had me right about where I was last year even with the extra hill. That’d also be the last time I checked my splits as the course would not match up with last year’s splits beyond this point. We crossed the bridge that now has handrails (the one TiVO wiped out on a few years ago) and Kassandra noted “this is my favorite part of the course”. We grinded out the hill and I pulled away just a bit on the messy downhill right before the power-line. I reached the junction where Greg Carson was making sure everyone did the loop part the right way (and also making sure no one headed back into the loop a second time) and I could see Justin Daglish (GLRR) up ahead. He is one tough nut to crack and had one heck of an XC season last year. The new power-line trail had him walking by the top. I closed from 15 seconds back to just a couple of seconds when we popped out on the power-lines and got some water. The new part after this was just fun. Some zigging & zagging, some great footing, some lousy footing, a couple of little uphills, some stonewalls to leap over (or crawl over), something for everyone! Justin went slightly off at one of the stonewalls and when he came back Kassandra and I had passed him and I was now in 11th place. We got to the bottom and Petey had sort of rhymed “when you see the cone turn for home”, homeward bound! The climb back up was tough but the new bridges made it somewhat easier. I felt I was gaining on the climbs and losing ground on the flats as Kassandra was still right behind me. We ran through the mountain laurel of Piekos Pass and I proclaimed, “this is my favorite part of the course”. After that we were on the out & back section and I was watching for runners. The messy climb was tough and a bit crowded but I got some cheers of encouragement. I was tired and counting down the remaining hills. I could see one guy up ahead and had not given up my hope of a top 10 finish. From 7 to 8 miles I closed on him and as we turned up the hill toward Launching I thought I might just have a shot. I also took a (hopefully) subtle look over my shoulder as I couldn’t hear Kassandra. She was only a couple of seconds back. From 8 to 8.5 I closed on the guy in front of me and slightly gapped my chaser. After that I started losing ground on the guy in front of me as he mustered a kick. I kept pushing and solidified my position (11th place). Finally the 93 under-passed loomed ahead and I knew I only had a few minutes to go. I crossed the line just under 1:07 and happy with a 50+ win if not a top 10 finish. Kassandra pulled in a few seconds later to win by over 4 minutes. Nicely done! I headed over to the results area and worked with the finish crew until the last runner came through. In all we had 153 finishers which is almost the same number as last year but half the size of the biggest field. CMS dominated the team competition, it was great to see my teammates supporting the race!